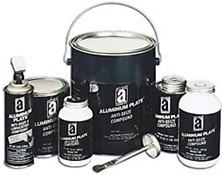 Aluminum Plate™ contains no lead or copper and has a synthetic, non-melting carrier. This lubricant depolymerizes and dissipates at temperatures above 400°F without leaving a carbon residue. It deposits a dry film of aluminum and graphite to plate and protect metal surfaces to temperatures of 2000°F (1095°C).